Opera had supplied the world with popular music since the early 1700s. For two centuries, as late as the premiere of Puccini's Madama Butterfly in 1906, many of the tunes people hummed on the streets of Europe and America were from operas. But in America during the first decade of this century, the public's taste for popular music turned to the operettas of Sigmund Romberg, Rudolf Friml, Victor Herbert, and Gilbert & Sullivan. Then the First World War suddenly turned public sentiment in this country against all things Germanic, including the operetta. America became tremendously isolationist, and for the first time, the “young Americans” took over the musical theatre – Cole Porter, George M. Cohan, Irving Berlin, the Gershwins, and a little later, Rodgers & Hart. The war gave them a chance they might never have gotten otherwise to have their shows produced, shows that were decidedly American in content, character, and pacing. By the end of the war, American popular music was coming largely from musical comedy. And the sounds of jazz were a big part it, thanks primarily to George Gershwin. But the musical theatre had grown away from the well-written, integrated book. The scripts written for musicals during the teens and twenties were little more than glorified vaudeville sketches. In 1943, that trend was reversed with Oklahoma!. And with that reversal, the music of the stage also reversed and headed back toward a more serious and somewhat “classical” style, instead of continuing in the same direction as pop music – the sounds of jazz and the Big Bands. By the early 1950s popular music and stage music had split. And rock and roll (which had evolved from jazz) took over popular music. Some of the “young Americans” from the 1920s and ’30s were still writing theatre scores, but were no longer the ones writing songs for the radio. The people who were writing for the stage didn't know rock and roll, and the new “young Americans” who were writing rock and roll songs didn't know stage music. It wasn't until 1968 and the Broadway opening of Hair that theatre writers were brave enough to use rock and roll in a musical. And rock musicals grew more numerous and more sophisticated during the 1970s, including a few attempts at Rock Opera (Jesus Christ Superstar, Tommy), which worked artistically but didn't take hold because adults, who were the majority of theatre-goers, still didn't like rock music. The albums sold well, however, to the much younger record-buying public. The mid-1970s was an exciting and experimental time for the rock musical. This decade turned out some remarkably successful shows, including Grease, the longest-running show in Broadway history until that time; The Wiz, a big step in the progress of the Black musical theatre; The Rocky Horror Show, a flop at first but a major cult classic soon after; and A Chorus Line, one of the most important and groundbreaking works of the musical theatre, and also the longest-running Broadway show in history. In fact, five of the ten longest running Broadway shows are now rock musicals. By this time, the teenagers of the 1950s and 60s had become adults, for whom the radio industry had created “adult rock” stations. And these new adult theatre-goers enjoyed theatre scores written in the style of rock and soft rock, the music they had grown up on. The early 1980s saw great innovation. Dreamgirls employed almost continuous music for an entire show, very much in the tradition of melodrama and opera, and pioneered the use of cinematic scene changes – dissolves, fades, close-ups, etc. – a device used most recently by City of Angels. Cats carried the notion of the plotless, non-linear concept musical to the extreme and the gamble paid off. And by the end of the decade, a new form had appeared on Broadway, by way of London and Paris – the Pop Opera. By the late 1980s and early 1990s, pop opera took hold in shows such as Les Misérables, Chess, and Miss Saigon. Pop opera used the structure of classical opera and the musical vocabulary of current popular music. It was the first time in almost a century that operas were being written in contemporary popular style, and it revitalized a stagnating musical theatre. For the first time since the rock operas of two decades earlier, songs from the stage were regularly crossing over to the radio and being recorded by pop singers, just as the show tunes of the Twenties and Thirties had. The American musical comedy is still young as art forms go, less than one hundred years old (not counting its various precursors). And its first generation of creators have only recently died and left the field open to new voices, voices raised on the sounds of rock and roll. The musical theatre had begun to wither because it was so hard for new voices to be heard. But now that the old voices have gone, perhaps the musical theatre will return to the legacy from which it came – speaking to its audience through the sounds of today, uniquely contemporary, uniquely brash, uniquely American. Note: How can this be A Tribute to the Rock Musicals 2, if it is New Line’s first show? 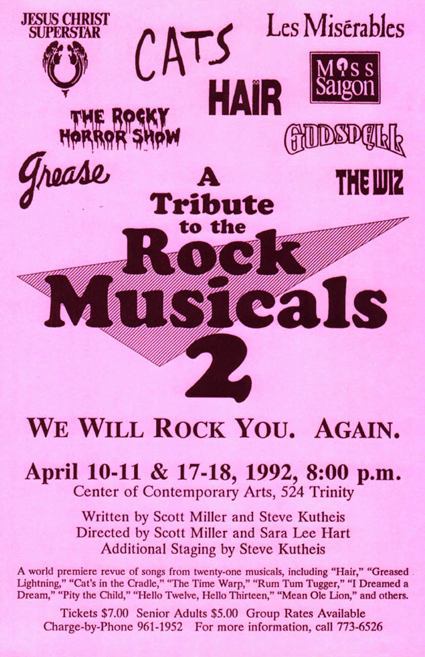 The reason this is number two is that the first Tribute to the Rock Musicals was done by many of the same people with CenterStage Theatre Company several years earlier. I was 18 years old when I first encountered New Line Theatre and Scott Miller. My only theatrical experience up until then had been a production of Guys and Dolls at St. Louis University High School and a production of Jesus Christ Superstar at the Muny – both of which were chorus roles. I was a rock musician that had sung in bands since my younger years and was in love with Superstar for the incredible rock score. It blew me away. One day I saw an advertisement for auditions of New Line’s Tribute to the Rock Musicals 2 and the Superstar logo jumped out at me. I ran home, put on my Superstar CD and searched for an audition piece. I decided on “Everything’s Alright.” I wanted to sing the part of Jesus. Not having had much auditioning experience, I was very nervous when I arrived. It must have taken me half an hour to fill out the audition sheet. I sat there, afraid that I was going to humiliate myself, and almost wimped out several times. I somehow managed to muster up the courage to stay until my name was mispronounced and fumbled into the audition room. When I walked in, there were two women and a guy, Scott, sitting behind a piano smiling. All were very friendly, but I was still nervous as hell. Scott began to play some ascending scales and asked me to sing along to get an idea of my range. Well, I totally choked. I couldn’t find a pitch to save my life. Scott stopped and told me to relax. We started over and it was a little better, but certainly nothing I was proud of. I prayed that he would at least let me sing my prepared piece so there might be some semblance of redemption for the audition. Luckily, he did and it went very well. He had me sing the Judas part as well as the Jesus part and kept mentioning to the other two women that we had found the guy that could sing “Pity the Child.” I didn’t know what the hell they were talking about, but it sure sounded promising. I left the audition feeling like I had accomplished something, although I didn’t quite know what. About a week later, I received a letter in the mail congratulating me and welcoming me to the cast of Tribute to the Rock Musicals 2. I was ecstatic! I was completely enthused until I looked at the enclosed song list. Scott didn’t cast me to sing the one song they were doing from Jesus Christ Superstar —”Everything’s Alright.” Being as that was the sole reason I auditioned, I was pissed. I contemplated not doing the show, but as corny as this may sound, something told me to stick with it. I decided to try something new and just give it a shot. That was one of the greatest decisions I’ve ever made in my life. Little did I know at the time, but I was about to embark on an eye-opening journey that would educate me, entertain me, and reveal an inner passion that even further enhanced anything I had experienced with music alone. Rock Trib was a revue that was designed to teach the audience about rock music and its evolution on the stage. It definitely accomplished that goal, but it also ROCKED! It was that combination of knowledge and entertainment that made me fall in love with New Line. Since then, I have been a part of many, many New Line shows and have worked with some utterly amazing casts. I would like to thank Scott Miller from the bottom of my heart for his incredible vision and the countless bits of information and advice that he has shared with me over the years. I treasure every moment I’ve had with New Line. 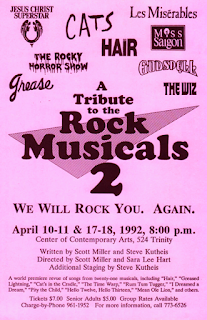 Looking back, Rock Trib 2 was almost insanely ambitious, assembling in one evening some of the biggest show stoppers from rock and pop musicals of the last twenty-five years – and as New Line’s very first show! The most ambitious – foolish? – part was including the Montage (“Hello Twelve, Hello Thirteen”) from A Chorus Line, a seventeen-minute musical sequence that included some very difficult solo work and some ridiculously difficult ensemble work. But this was the most talented cast I had worked with up until this time, and I think by sheer force of will we pulled it off. We recreated one of the most amazing, most emotional, most exciting musical sequences in the history of musical theatre, and it worked. It was exciting as hell. I’ll never forget the first performance. When we finished the number, and the actors slowly melted back into that famous silhouette on that famous line, as the band hit that final musical button, the audience went wild. Cheering, screaming, whooping. It was a portent of things to come for New Line – repeatedly jumping off metaphorical cliffs into the waiting arms of enthusiastic, adventurous audiences. I carry that moment with me forever, every time I wonder if we can pull off my latest folly, every time we start rehearsals for a Sweeney Todd or a Passion or a Floyd Collins and I think, “How on earth can we do this?” The answer is that I don’t know how, but I know we will.